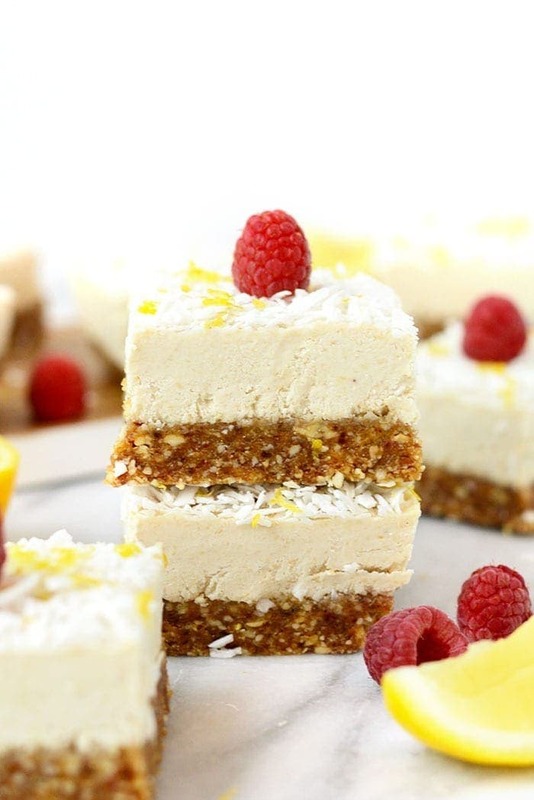 Spring has sprung with these delicious Vegan Cheesecake Bars. 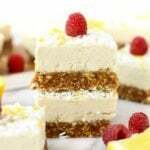 That’s right, this Lemon No Bake Vegan Cheesecake recipe is made with real ingredients and doesn’t require an oven. Raw Vegan Desserts are some of our favorite sweet treats to make in our kitchen. We love that they don’t require an oven and that all of the delicious ingredients used are in their purest forms. That’s why we have so much love for this particular recipe. 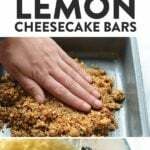 These Lemon Vegan Cheesecake Bars are naturally sweetened, gluten-free, vegan, paleo, and a perfectly refreshing dessert! Vegan cheesecake may sound like a daunting thing to make, but we’re going to break everything down for you with a step-by-step tutorial! Soaked, raw cashews: these babies are the basis of the vegan cheesecake filling. Make sure that you buy raw, unsalted cashews and that you properly soak them. Coconut cream: for this recipe, we used coconut cream which is slightly different than full-fat coconut milk. You can find this at most grocery stores right by the canned coconut milk! Coconut oil: the coconut oil will help with the setting process because it solidifies at room temperature! Honey or maple syrup: if you want to keep this recipe 100% plant-based, opt for maple syrup instead of honey! 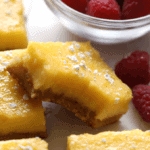 Lemon juice: this is what will give your vegan cheesecake that yummy, lemony flavor! Lemon zest: don’t skimp on the lemon zest topping. So yummy! We recommend a high-speed food processor or Vitamix to make this filling. I will say this over and over again, but when I say high-speed, I mean high-speed! You’re going to need something that can pulverize all of these ingredients into a creamy filling. Medjool dates: make sure your dates are soft and sticky AND, don’t forget to remove the pits. Raw cashews: for the best results, use raw cashews instead of roasted. Salt: if your cashews were already salted, feel free to omit this! 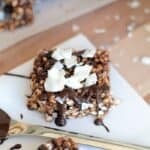 Unfortunately you can not ditch the dates in this recipe, howeve ryou can swap the cashews for almonds or pretty much any other nut. 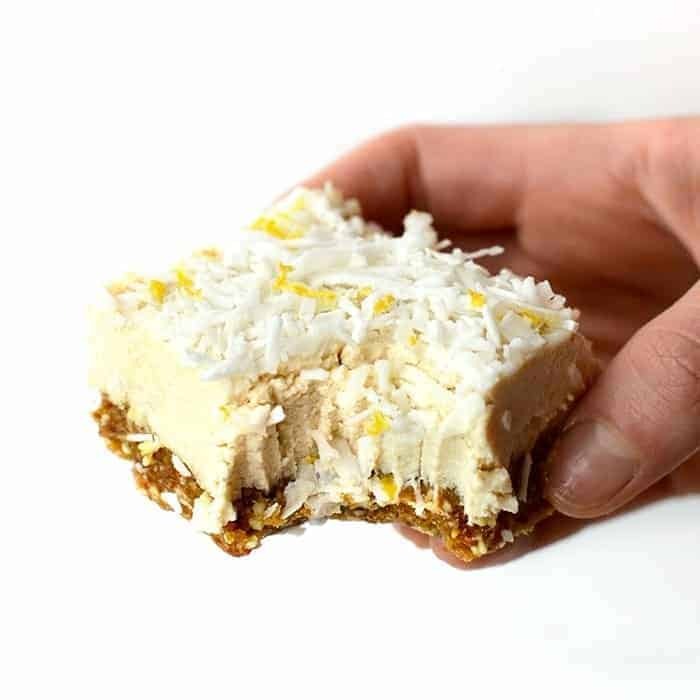 These No Bake Vegan Cheesecake Bars are best eaten straight out of the freezer or fridge. If you eat them frozen, they are like an ice cream bar and if you eat them partially thawed from the fridge, they’re more like cheesecake! It’s all about preference people. What’s my choice? FREEZER. I just love sinking my teeth into a frozen ice cream bar of sorts. Storage: Keep these bars stored in the fridge or freezer for the longest lasting results. If possible, keep them covered, too! First, place two cups of cashews into a medium/large size bowl and cover them with boiling water. Let them soak for at least an hour or overnight. These cashews are for the filling. Next, place crust ingredients into a high-speed food processor and process until crumbly. After ingredients are blended, spray a 9×9-inch pan with coconut oil cooking spray. Gently press crust evenly into the bottom of the pan. Set aside. Once cashews have soaked for the appropriate amount of time (cashews should be soft and squishy) place all ingredients for the lemon filling (except coconut oil) into a high-speed food processor or Vitamix and blend until smooth. When the filling is a smooth consistency, add coconut oil and mix one more time to fully combine all ingredients. Pour filling contents on top of crust. Spread evenly with a spatula and place pan into the freezer for 1-2 hours to set. When bars are hard and ready to eat. Remove from freezer, top with shredded coconut and lemon zest. 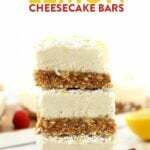 Storage: store bars in the freezer for more of an ice cream bar texture or in the fridge for more of a cheesecake texture.